Rely on Darrell's Auto Sales & Services in Wallingford, CT 06492 to provide quality care for your vehicle's undercarriage. 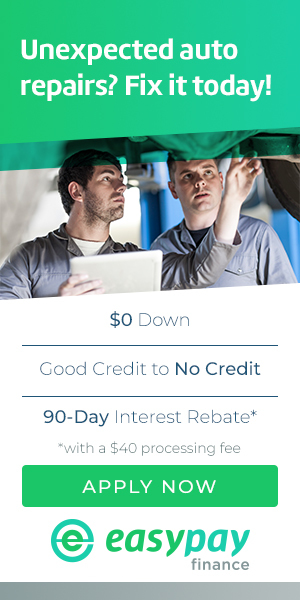 Stop by our shop to see how we can help you or call 203-626-9741 for more information. Wheel alignment (or simply alignment) is standard car maintenance that involves adjusting the angles of the wheels so that they are set to the manufacturer's specifications. The main purpose is to let the suspension and the steering systems operate at their desired angles - this reduces tire wear. Alignment is a complicated process and not all mechanics get it right. To have experts handle your car's alignment, visit Darrell's Auto Sales & Services. Anti-lock brakes prevent wheel lock-up when rapidly decelerating by automatically modulating the brake pressure during an emergency stop. With this system, the wheels are able to maintain traction with the road while braking. Failure of the anti-lock brakes could lead to an increase in the risks of multiple vehicle crashes and run-off road crashes. To avoid this, have your anti-lock brake system checked and repaired by experts. At Darrell's Auto Sales & Services, we have anti-lock brake experts who will examine and repair your faulty ABS - keeping you safe. Brake fluid is hygroscopic (it absorbs moisture). The absorbed moisture lowers the fluid's boiling point. It also corrodes the lines and cylinders. With the lowered boiling point, the brake fluid could boil during braking which makes you lose braking ability. Although this is an extreme scenario, it does happen in heavy braking. To reduce the effects of the absorbed moisture, auto manufacturers recommend that you have a brake flush done periodically. A brake system flush involves the replacement of used and contaminated fluid with fresh fluid. With Darrell's Auto Sales & Services's quick lube services, you will have a brake system flush performed by brake experts. 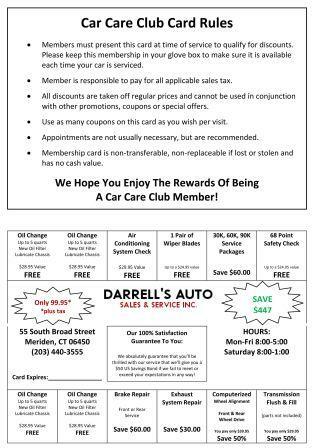 Call 203-626-9741 or visit Darrell's Auto Sales & Services today. A brake is a mechanical device for slowing or stopping a vehicle (usually by means of friction). In short, a brake inhibits your car's motion. It lets you stop the car whenever and wherever you choose. Brakes are one of the most important parts of a motor vehicle. Without them, you would not be able to stop the car. If your vehicle's brakes are having issues, consider having them worked on. Brake experts at Darrell's Auto Sales & Services can work on your car's brakes to ensure you have a safe drive. A chassis is the car's internal framework that supports the body and other parts like the wheels, engine, transmission, driveshaft, differential, and suspension. A weak or damaged chassis will translate to a weak car. To have a strong and properly working vehicle, have your car's chassis checked for defects. At Darrell's Auto Sales & Services, there are experienced undercar service providers who can work on your chassis. The differential is a car part that compensates for the difference in travel distance between the inner wheels and outer wheels when the vehicle is turning. Due to the differential's position in most non-four-wheel-drive (FWD) vehicles (located at the rear and under the car), it does not get any of the star treatment the engine gets. The one thing that every car owner needs to know is that failure of the differential will mean failure of the car. To save the differential from failure, you need to have differential fluid changed every 30,000 to 50,000 miles. Changing the oil on the differential is as important as changing the car's engine oil. Although checking and changing differential oil is pretty easy, you need to visit an auto shop to get a comprehensive differential flush. For differential flush services, visit or call Darrell's Auto Sales & Services in Wallingford, CT 06492 today. The differential transfers the engine power to the wheels. One important function of the differential is to pass on power to the wheels while allowing them to rotate at different speeds - thus the name differential. When turning, the outer wheels travel a larger distance than the inner wheels do (also the front wheels travel a longer distance than the rear wheels). This means that all four wheels travel at different speeds during a turn and this is where the differential comes in to help. To make sure your vehicle's differentials are working properly, have them checked regularly. Contact Darrell's Auto Sales & Services today for differentials examination and servicing. A driveline is a part of your motor vehicle that connects the engine and the transmission to the wheel axles. The driveline consists of the parts of the powertrain less the engine and transmission. Failure of the driveline means that the car would not move since energy cannot be transmitted from the engine to the wheel axles. Therefore, make sure that your car's driveline is regularly inspected and serviced. And, at Darrell's Auto Sales & Services, you can have the driveline serviced by experts. In a motor vehicle, an exhaust system is a piping used to guide exhaust fumes away from the engine - usually to the rear of the vehicle. A properly functioning exhaust system not only sounds better, it is better - for you, your car, and the environment. Darrell's Auto Sales & Services has expert technicians to service your car's exhaust system. Shocks (or shock absorbers) are mechanical devices designed to smooth out rough roads. The devices do this by converting kinetic energy to another form of energy. Properly working shocks reduce the effect of traveling over rough ground, leading to improved ride quality and vehicle handling. When shocks develop problems, driving on poorly leveled roads becomes unpleasant, and your vehicle may sway when turning. To have your vehicle's shocks diagnosed and repaired, visit Darrell's Auto Sales & Services today. Much like a shock absorber (shocks), your car's struts provide a dampening effect as you travel over a road's surface. By absorbing the shock of the road, struts allow passengers to ride in a car without constant and uncomfortable motion. Struts work a bit differently than shocks in that they provide structural support for your car's suspension. This means that struts support your car's weight, unlike shocks which only regulate the speed at which the weight is transferred. Struts usually last around 50,000 or 60,000 miles. This is simply because the damping characteristics of the parts gradually deteriorate over time. Call Darrell's Auto Sales & Services at 203-626-9741 if you have questions about the struts on your car. Our expert technicians will diagnose any problems and help you make an informed decision about repairs. As tires get older, they lose traction and deteriorate from the inside out, increasing the likelihood of a tire bursting. This can cause a rapid loss of control of your vehicle. To have a better performing vehicle, you need to make sure the tires are in good condition. For all your tire needs, contact Darrell's Auto Sales & Services today.